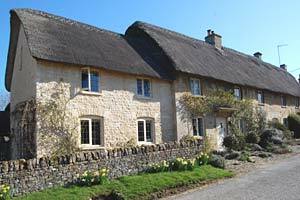 The Cotswolds has many beautiful walks that range from a couple of miles and an hour or two to The Cotswold Way which takes several days. 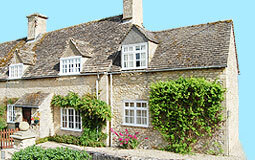 A selection of walking itineraries are kept in the Cottage for the use of guests, as are leaflets of local attractions. Alternatively, many visitors choose to cycle around the Cotswolds. Of course these activities can take as much or as little of a holiday as you wish. 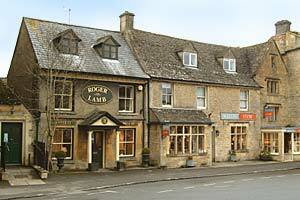 Each of the larger Cotswold villages is unique and has its own character. It is possible to spend half or a whole day in one village, or tour several and spend no more than an hour or two in each. Generally, the more time that is spent in each village, the more you will gain from exploring it. 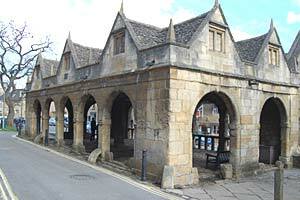 Burford. 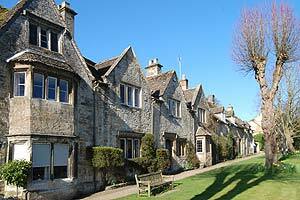 One of the most photographed villages in the Cotswolds due to its setting on a steep hill down to the River Windrush. 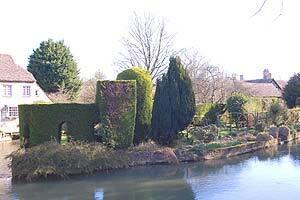 Much of it was built with the wealth of the wool trade, when it was an important market town. 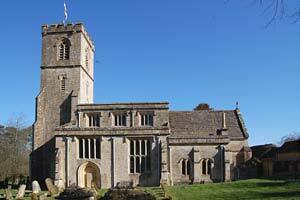 There are many buildings from the 15th century, and a wonderful church. One-off shops mingle with antiques shops, tea rooms and pubs. It's somewhere to wander about and explore the side streets. The meadow by the Windrush is a great place just to sit and take stock of the world. 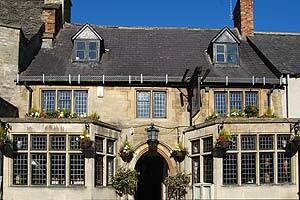 Stow-on-the-Wold. A very different setting. As the name implies, at the top of a 700 feet hill, set around a spectacular village square with magnificent antiques shops. Once upon a time markets with up to 20,000 sheep would be led in Stowe. 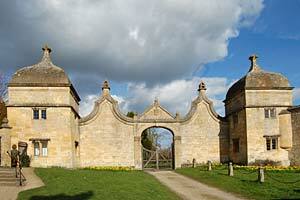 It was also the location of the last battle of the English civil war. These days it' a rather more tranquil place, but no less interesting! Somewhat less romantically, but very practically, one of the largest supermarkets in the Cotswolds situated on the edge of the village. 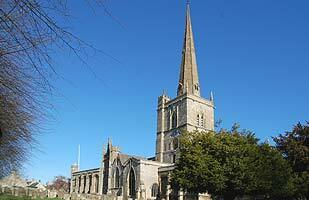 Moreton-in-Marsh. As its name implies, on a flat piece of land that is still frequently flooded. 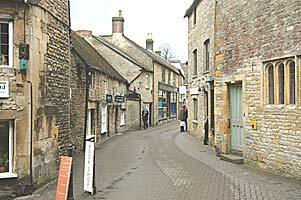 Moreton basically consists of one very long street, lined with fascinating shops on both sides. A source of more reasonably priced antiques than the elegant shops of Stow., interspersed with numerous tea shops and excellent delicatessens. The sixteenth century Curfew Tower is worth inspecting. Tuesday is market day, still a lively affair. Bourton-on-the-Water. 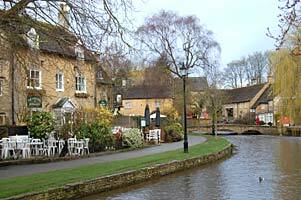 A beautiful village on the banks of a slow stream that is best seen early or late in the day. It does get more crowded with tourists than many of the villages and has its share of tourist shops. However the stream running right through the middle of the village, with ducks gently quacking their way around it makes it well worth a visit. There are a number of "attractions" that make it very useful family stop, especially on wet days. My family loved the Cotswold Motoring Museum, which has the original "Brum". The model railway exhibition has four magnificent models, fronted by an excellent model and toy shop. Birdland has an amazing collection of birds, which can be seen at close quarters. The horse riding at Bourton Vale Equestrian Centre is suitable for children as well as adults and abilities of all ages. The Cotswold Leisure Centre has a large indoor pool sauna and spa as well as a fully-equipped gym, all open to the public. It is necessary to ring to check when the pool is open for public swimming as it often closes for school swimming lessons (01451 824024). Chipping Camden. 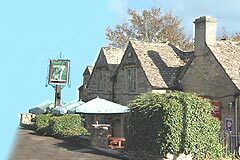 Arguably one of the most magnificent of the Cotswold villages, it still exudes an air of wealth that it has had for 500 years! These days it has fewer antiques shops than it once did, but the buildings are so magnificent, that it's worth visiting just to view those. It has a wonderful slightly-exotic air to it. Broadway. Drive to Broadway via Fish Hill (known locally simply as "The Fish"), a sharp double hairpin road down the side of an escarpment. This is the main road, an A road, but still a spectacular drive. You will pass Broadway Tower, a strange folly built in 1799 to act as a beacon across the valley below. The views from the top can extend as far as Gloucester and the Severn Valley on a clear day. The Tower is open to the public and features a small exhibition about its past. This features the Morris room in honour of the famous designer William Morris, who lived in the Tower. Broadway itself features a beautiful main street with fascinating designer shops along its length as well as a selection of pubs and tea rooms. Toddington. 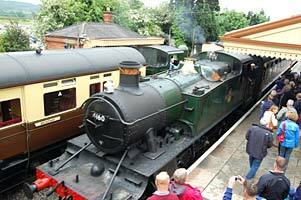 Gloucestershire Warwickshire Railway "The Honeybourne Line".